1. God owns all things. 2. All things come from God. 3. We and all that we have belong to God. The Bible says that we are God's "stewards." 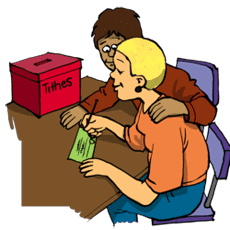 A steward is one who manages the money or property belonging to another person. As God's stewards, we are accountable to Him for the way we manage what He entrusts to us. 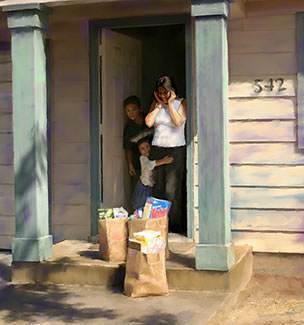 In this lesson we will learn how we can be good stewards, especially in the matter of giving. We will learn how we can use our money to make eternal friendships. When God brought His people out of slavery in Egypt and into Canaan, He gave them a rich and fertile land. Of all that they produced on this good land, God required that they give the first tenth to Him. This was called "the tithe." 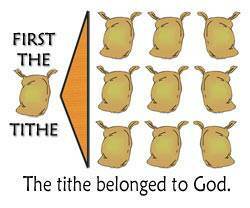 The word "tithe" means "the tenth." 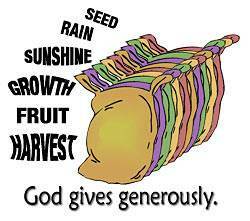 When God gives, He gives bountifully. He is very generous. 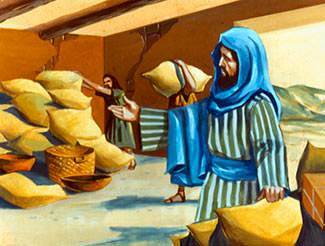 In Jesus' time, people bought their grain in bulk. Many sellers would pour the grain into a measure without allowing the buyer to shake it down. Not so with the Lord. He gives "good measure, pressed down, shaken together, and running over." Both the Old and the New Testaments lay down the same teaching: When we give to God, God gives to us. God is not poor; neither is He stingy. He loves to give to His children, but we must fulfil His condition—"Give, and it will be given to you." God tells us to give because He wants His children to be like Him. God is generous, and He wants us to be generous. Another reason why God asks us to give is that we might "lay up treasure in heaven." We cannot send our money to Heaven, but we can give it to win others to Christ. This is laying up treasure in Heaven. First, give yourself to God. What percentage of our income should we give? We can take the tithe (ten percent) as a guide to the minimum we should give, but our giving could be much more than this. It depends on how thankful we are for the way God has blessed us and how strongly we desire to "lay up treasure in heaven." The Christian businessman, R.G. LeTourneau, made a practice of giving ninety percent of his earnings to God. One day someone asked him, "Mr. LeTourneau, is it true that you give ninety percent of your income to the Lord?" He replied, "No, I don't give God anything. It all belongs to Him. I just keep back ten percent." No one is excluded. Old and young, rich and poor—all must be involved in giving. The Bible says, "EACH ONE OF YOU should set aside a sum of money in keeping with his income." The Lord Jesus said that we were to be "good and wise stewards." Some Christians give liberally, but they are not wise in their giving. To give to a church or organization that is not faithfully preaching God's Word is not wise giving. We should be as careful in investing our Lord's money as we would be in investing in a business. 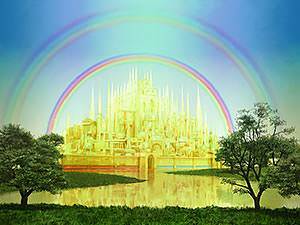 We should invest it where it will bring the greatest spiritual returns. 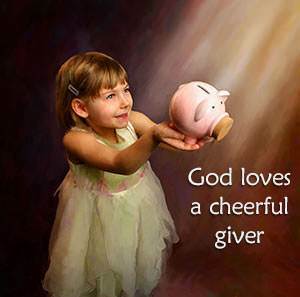 You do not have to possess large sums of money to be a large giver in God's sight. God does not measure our giving by the size of our gifts. He measures our giving by how much we give out of what we have. 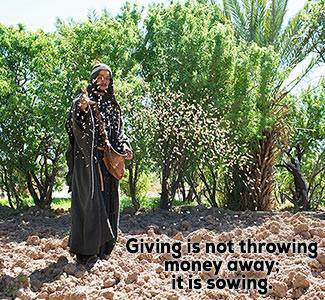 God looks at how much sacrifice is involved in our giving. By God's way of measuring our giving, a poor person can give as much or more than a wealthy person. We should give to our local church. We should give to those who have helped us spiritually. We should give to those who are taking the gospel to the lost. Every Christian has a responsibility to get the gospel to the lost. God's command to us is, "Go into all the world, and preach the gospel to every creature." (Mark 16:15) If we cannot go ourselves, we should count it a privilege to help support missionaries who are taking the gospel to those who have never heard of Christ. Jesus often taught His disciples by means of parables. A parable is a short story that brings out one or more spiritual truths. In Luke 16, the Lord Jesus told of a certain rich man who had a steward who managed his property for him. When the rich man received word that his steward was wasting his goods, he called his steward before him to give an account of his stewardship. When the steward realized that he would soon be out of a job, he said to himself, "What shall I do? For my master is taking the stewardship away from me. I cannot dig; I am ashamed to beg. I have resolved what to do, that when I am put out of the stewardship, they (the friends I am going to make) may receive me into their houses." This steward devised a plan to provide for his future. 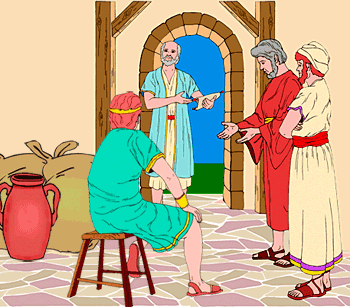 He decided to call his master's debtors to him and make generous settlements with them. In that way they would become indebted to him and become his "friends." Then, when he was out of a job, these "friends" would receive him into their houses and provide him with room and board. "So he called every one of his master's debtors to him, and said to the first, 'How much do you owe my master?' And he said, 'A hundred measures of oil.' So he said to him, 'Take your bill, and sit down quickly and write fifty.' Then he said to another, 'And how much do you owe?' So he said, 'A hundred measures of wheat.' And he said to him, 'Take your bill, and write eighty.'" The steward did likewise with all who owed his master. What was he doing? He was providing for his future. He was making "friends" for the future time when he would be out of his job. 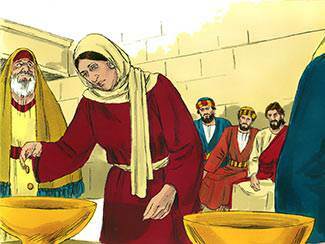 The master of the steward commended his steward for his shrewdness even though it meant some loss of revenue to him. He recognized that the steward needed to provide some security for his future. Life is a stewardship, not an ownership. All that we have belongs to God. We do not own anything. We are simply God's stewards, managing what He has entrusted to us. One day we must give an account of our stewardship. 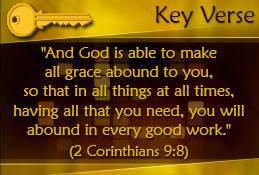 God has given us life, health, talents, abilities, money, and other things. One day we must give an account to Him of what we have done with that which He has entrusted to us. To hear Him say, "Well done, thou good and faithful servant," will be worth more than anything this world has to offer. 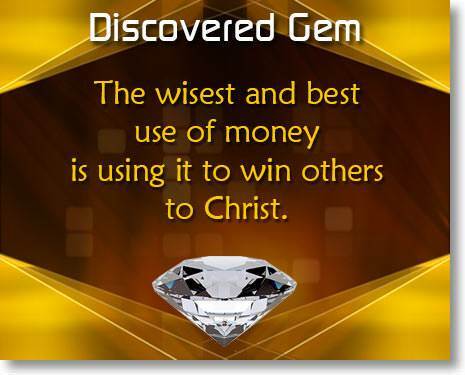 The wisest and best use of money is using it to win others to Christ. What the Lord is saying here is that we are to use our money to make eternal friendships so that these friends we helped win to Christ may be there to welcome us when we enter Heaven. The story is told of an old gentleman in England who was approaching his eightieth birthday. Not knowing what to give him, his children and relatives decided to pool their gifts and give him the money to buy whatever he wanted. The relatives collected a sum of money equal to about $2,400. When he was told of this, the old gentleman asked, "Do you mean that you have collected this sum of money and I can do what I want to with it?" When they assured him that this was correct, he said, "I want this money to pay for printing the Bible in a new language for a tribe of people who have never had God's Word in their own language." The relatives checked with the British and Foreign Bible Society. An official there said, "This is amazing! 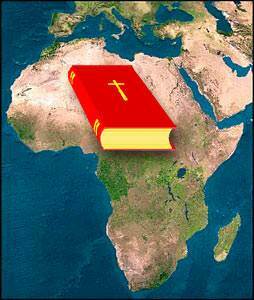 Some missionaries in Africa have been working for years translating the Bible into a new language. We have just received the manuscript." When asked how much it would cost to have the Bibles printed in this new language, the official said, "About three thousand dollars." Quickly the relatives passed the hat around again and collected the additional money that was needed. In our imagination, let us picture this old gentleman as he entered Heaven some years later. Already, many from that tribe in Africa had died and gone to Heaven. 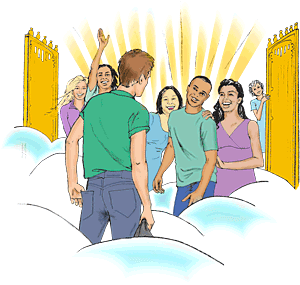 As he enters a group of people greet him and throw their arms around him. They say to him, "You are our friend. We have been waiting for you." The old gentleman looks at them in surprise and says, "But I don't know you. Who are you?" "You may not know us," they say, "but we know you. You are the one who gave the money that made it possible for us to have God's Word in our own language. If it had not been for you, we would not be here in this beautiful place. You are our friend forever!" A day is coming when our money will be useless and meaningless. A day is coming when our stewardship will be over. In the little time we have left we should use our money to win others to Christ and thus make eternal friendships. This is the wisest and best use of money. Each of us should ask ourselves these questions: Am I a good steward of all that God has entrusted to me? Am I using my money to make eternal friends? Will there be anyone to greet me in Heaven and say to me, "If it had not been for you, I would not be in this beautiful place. You are my friend forever. "?